Fred Wilson, a New York-based conceptual artist, has used the the museum as his medium for decades. His most well-known “intervention” may be “Mining the Museum” at the Maryland Historical Society (MHS) in 1992. Wilson worked with the MHS collection and reinterpreted its displays to make statements on class and race, exposing that the MHS had been telling a very white, affluent narrative. One installation entitled “Metalwork 1793-1880” looked like a typical display of silver pitchers and cups, but among them were shackles worn by an enslaved person. Another installation entitled “Cabinet Making 1820-1960” showed a variation of wooden chairs in different styles along with a lynching post made of wood. Throughout the intervention, Wilson used the typical museum categorizing conventions to express what usually goes unsaid within the MHS: a history of violence, exploitation, and erasure. In a talk celebrating the 25th anniversary of “Mining the Museum,” Wilson explained that he chose the MHS because, “When I went into the Historical Society, I had kind of a visceral response. I felt uncomfortable there…I thought, if I’m having a visceral response, and not really understanding it, I want to explore why.” Marabou thinks everyone should take a moment to gauge how they feel during a museum visit. Do you feel neutral, uncomfortable, intrigued, wanting to leave immediately? Why do you feel that way? Look at your surroundings, is it the exhibition content, the architecture? Is it other visitors? Wilson is a keen observer of how museums function and how they make people feel. His installations draw visitors to moments of “oh [expletive]” surprise or a chuckle and nod in agreement. Wilson challenges expectations, comfort levels, and adds new perspectives. During the 25th anniversary talk, visitor reactions to “Mining the Museum” were revisited, including that of a 62-year-old retired dentist from Easton, Pennsylvania who, “breathlessly exclaimed, in an exit survey, that the show ‘has the ability to promote racism and hate in young blacks, and was offensive to me! !’” Marabou appreciates this type of reaction. In a perfect world, that dentist would have taken the time to think about why he found the installation so offensive, why he was so uncomfortable. The dentist likely never thought that someone, as Wilson did, found the previous exhibitions at the MHS offensive because the history and impact of slavery in Maryland was avoided. Through his work Wilson creates a moment with each visitor where he asks them to think twice, inviting the visitor to explore why they might feel confronted or validated by his installations. Marabou sees a lot of power in Wilson’s ability to capture the visitor, even if it’s briefly. Marabou sees Wilson’s work as subverting both the museum – by critiquing display and curatorial practices and more – and subverting the visitor’s understanding of what a museum is, what a museum communicates, and what a museum perpetuates. Two of Wilson’s works, “Guarded View” and “My Life as a Dog,” bring up issues of race and class by calling attention to who works in the museum and highlighting visitor blindspots. “Guarded View” (1991) is a sculpture composed of four headless mannequins with dark complexions. Each is wearing a different museum uniform from a New York City museum, the Metropolitan Museum of Art, the Jewish Museum, the Museum of Modern Art, and the Whitney Museum of American Art. Each mannequin stands at ease with its arms by its sides. This sculpture was inspired by Wilson’s own experiences as a museum guard during which he always felt on display, but at the same time invisible. 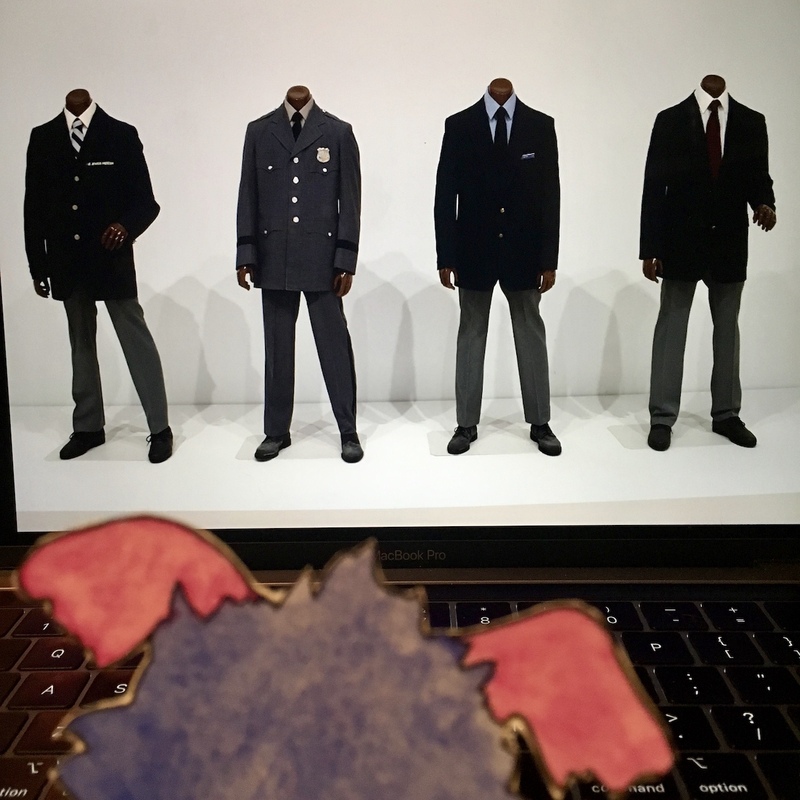 In a Whitney video clip, Wilson explains his intent with the four headless, nameless mannequins, “What I was really pushing for is for the museums to just be a little more self aware.” Wilson’s work confronts the visitor asking, why are the mannequins headless? Whose artwork is worth guarding? Who is guarding the work? Who gets to look at art while someone else guards it? These questions may be followed up with more including, whose artwork gets to be displayed in museums? Whose work is considered art? Looking at the broader demographics of the populations represented in the answers to these questions, we’ll see there is definitely a disparity when it comes to race and class. Wilson’s questions will linger even when visitors are no longer viewing the mannequins. As visitors pass a real-life guard when exiting the gallery, they’ll perhaps, for the first time, think about the experience of a museum guard. “Guarded View” was originally on display in the show “Primitivism High and Low” at Metro Pictures gallery in 1991. It is now in the collection of the Whitney Museum and was on display as part of the inaugural exhibition, “American is Hard to See,” when the museum opened its new building in 2015. The Whitney online catalog entry for “Guarded View” says, “Fred Wilson’s Guarded View aggressively confronts viewers with four black headless mannequins dressed as museum guards.” Having seen the work in real life, Marabou doesn’t see anything “aggressive” about the four headless mannequins in museum guard uniforms. The use of “aggressive” might reveal the way critique is received by the museum. Perhaps critique is interpreted as an attack instead of an opportunity to learn and reconsider. The entry goes on to say that Wilson’s work is, “pointing to the hidden power relations and social codes that structure our experience of museums.” Sometimes when confronted by the truth, the messenger is interpreted as aggressive because the message challenges one’s sense of comfort. A year following “Guarded View,” Wilson brought the sculpture’s message to life. For Marabou, it is particularly interesting that Wilson’s audience was a group of docents, people who “work” in the galleries. One would think the docents would know the guards, say hi or nod as they moved through the galleries. Wilson drew attention to the racial and class lines that are invisibly drawn between workers who share the same space. Many volunteer docents have the privilege of offering their free time because they are economically stable. Volunteer docents in New York City museums, from what Marabou has observed, are mostly white. Volunteering should not be looked down upon–museums and cultural sites need and lean on volunteer support–but it is important to think about what factors make it possible for someone to volunteer their time. Marabou could write pages upon pages about Fred Wilson’s work. This likely won’t be the only post about Fred. During a week when Marabou is thinking about subversion at the museum, Fred Wilson’s work is an example of constructive subversion of the museum. Is art that challenges and critiques the museum subversive if it is welcomed and invited by the museum? In the Whitney video referenced above, Fred says, “Some people are much better at agitating from the outside. And I am someone who, it makes more sense for me to work within the institution, to be kind of a moral rudder in certain ways.” Marabou thinks that for any type of change to happen at museums, there must be players who are working externally as well as internally. Fred is now on the Board of Trustees at the Whitney, sitting among the power players in the museum world. Does being a member of the board mean Fred Wilson’s critiques of museums are more welcome? Is having Fred on the board of the Whitney a way for the museum to show their awareness of museum problems? Does Fred’s presence on the board absolve the unethical actions of other Whitney trustees? Marabou is curious to know Fred’s opinion on fellow board member Warren B. Kanders and the public discussion of whether or not Kanders should be removed for ethical reasons. PreviousIs it subversive for museum staff to unionize?